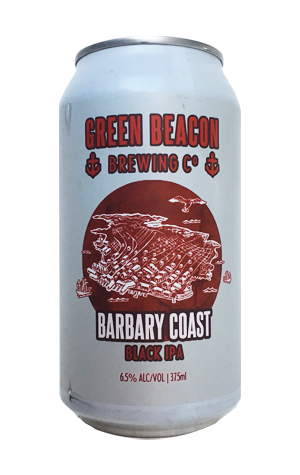 Barbary Coast has been through a few iterations over the years, but the 2018 version may be the tastiest one yet. Whether you prefer to call it a Black IPA, a Cascadian Dark Ale, or an India Black Ale, just know this: it looks dark but, if you close your eyes, you’ll be forgiven for thinking you’re drinking a fine West Coast IPA, if only for a moment. The colour is a rich brown, almost black, with a light brown head. But the aroma isn’t one of a dark beer – it’s bursting with fresh pine and sweet fruit. The lovely, silky mouthfeel wouldn’t go astray in a heavy stout, but the main flavours are hops, hops, hops: citrus, pawpaw, a little pine and a little earthy spice derived from Simcoe and Mosaic. The smooth, lasting bitterness owes its existence largely to the hops (they truly are the masters here), but also carries a whisper of the roastiness from the dark malts. Drink fresh to experience Green Beacon’s mastery of IPAs. With a little age, expect some more roasty and coffee flavours to creep in – if it lasts long enough.